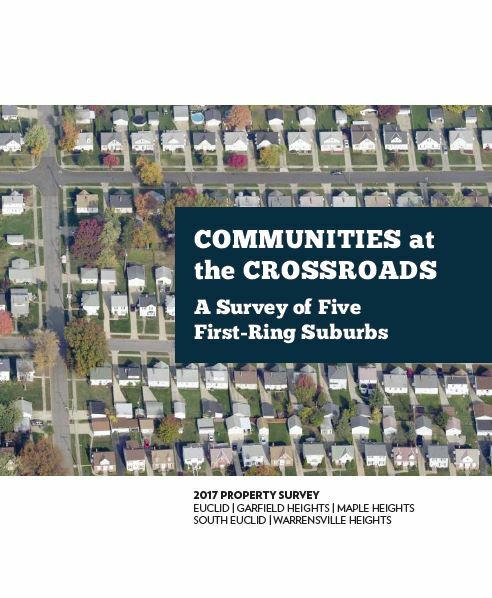 A new report, Communities at the Crossroads: A Survey of Five First-Ring Suburbs, examines the housing market challenges and opportunities facing Euclid, Garfield Heights, Maple Heights, South Euclid, and Warrensville Heights in the wake of the foreclosure crisis. 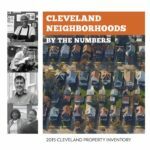 The report, released on Jan. 28, summarizes key findings from a property inventory and analysis commissioned by the City of South Euclid and conducted by Western Reserve Land Conservancy and Dynamo Metrics. “Ohio cities were ravaged by the foreclosure crisis. Though many have seen and studied the devastating results in Cleveland, few have examined the detrimental impact on Cleveland’s inner-ring suburbs,” explained Jim Rokakis, vice president of the Land Conservancy and director of its Thriving Communities program. The report notes that the foreclosure crisis, along with suburban expansion and out-migration, took a serious toll on first ring suburbs in Cuyahoga County. The Cleveland Foundation board of directors awarded a $197,540 grant to the City of South Euclid in 2017 to study the effects of the foreclosure crisis on five of Cleveland’s inner ring suburban communities and to strategize potential housing market recovery solutions. 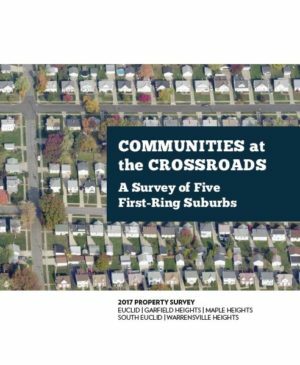 In order to complete the study, the City of South Euclid contracted with Western Reserve Land Conservancy to complete a property inventory of five communities – Euclid, Garfield Heights, Maple Heights, South Euclid, and Warrensville Heights – and analysis of housing marketing trends. The city also contracted with Dynamo Metrics to create a web-based mapping and decision-support tool for these communities. “By teaming up with other municipalities facing similar issues of vacancy and abandonment, we are better able to make strategic and cost-effective decisions to support each of our communities,” explained Sally Martin, Housing Director for the City of South Euclid. The Land Conservancy began the property survey in July 2017. A 14-member team worked through the beginning of September to inventory 56,346 parcels in the five suburbs. Information about each parcel—including its vacancy status, the condition of any structures on it, and a photograph—was recorded on a tablet computer using a mobile app developed by Loveland Technologies. If team members were approached by local residents and neighbors, they recorded any comments provided, along with the data about each property. 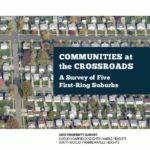 The analysis, along with specific survey data for each community, the impact of residential demolitions and rehabilitations, interviews with the respective mayors, and an action agenda for first-ring suburbs, can be found in the new report: Communities at the Crossroads: A Survey of Five First-Ring Suburbs. “In an era of declining municipal revenues, all cities are faced with doing more with less. Having this data will allow cities to make strategic and highly targeted interventions to achieve the best results at the least cost. Data-driven decision making is critical for first-ring suburbs,” explained Martin. In addition to the report, Dynamo Metrics developed a Neighborhood Intel tool for each of the five participating cities. 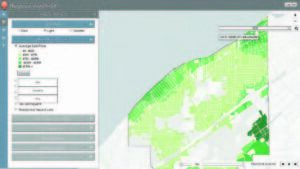 This easy-to-use web-based mapping and decision-support tool provides cities with the ability to contextualize and explore property survey data with respect to indicators of neighborhood health and economic activity, including data points provided by Northeast Ohio Community and Neighborhood Data for Organizing (NEO CANDO) and the Census Bureau. The tool also allows cities to monitor the property value impact of demolition and rehabilitation work performed since 2009. “The Neighborhood Intel tool provides cities with the ability to identify problems and to proactively plan and target policies that maximize positive impact in their communities,” explained Nigel Griswold, cofounder and managing director of Dynamo Metrics. 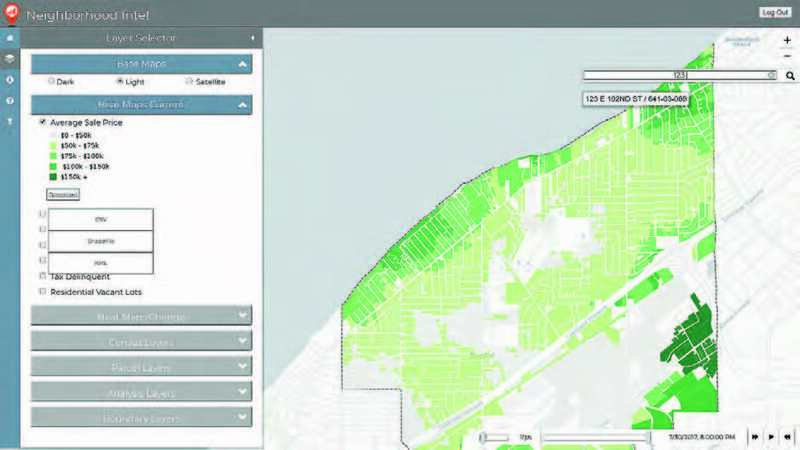 “Our user friendly online dashboard and mapping tool includes access to the impact of blight removal through demolition and rehabilitation as well as clickable detailed information on property and neighborhood change. Not only is data easily accessible, it is ready to be used to quantify the economic and social outcomes of policy action.” For the Communities at the Crossroads report, the firm found that the total property value impact of all residential demolitions and rehabilitations in the five suburbs since 2009 is estimated at nearly $325 million. Each of the five cities also received two tablet computers, loaded with survey data for all properties in their respective communities and ongoing user licenses from Loveland Technologies. These computers give the communities the ability to update and create their own data about local property conditions, the most important action step listed in the Communities at the Crossroads report. Additional action steps call for strong code enforcement, assistance in reducing tax delinquency and expanding homeownership, expansion of financial tools for home rehabilitation, as well as work to tackle crime and foster social cohesion.